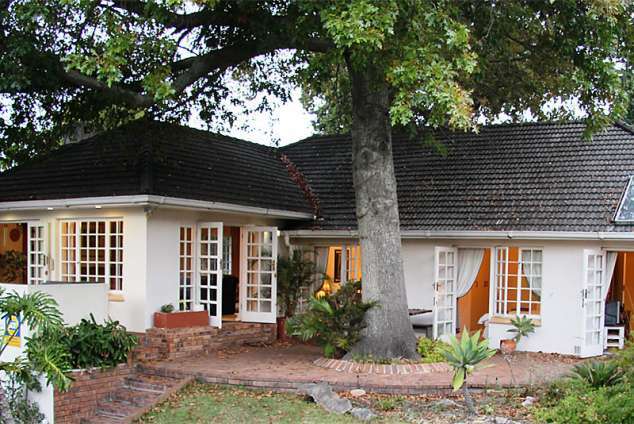 Acorn Tree - family accommodation sleeps 7 - Newlands Accommodation. Acorn Tree guest house accommodation has 3 double bedrooms which open onto the sunny, quiet private walled garden with wonderful Table Mountain views. Acorntree luxury accommodation in Cape Town is situated close to the Kirstenbosch Botanical Gardens, at the foot of Table Mountain. The University of Cape Town is located close by with the Newlands Cricket and Rugby stadium only 5 mins away. The guest house provides linen and towels, weekly home and garden services. Pre-paid telephone. Child safety pool net. Please Note: Pets allowed by prior arrangement. 1) Leaving the airport, take the N2 to Cape Town - Right lane. 2) Continue on N2 for approximately 11 Km with Table Mountain in front of you. 3) Get into the KIRSTENBOSCH-M3 lane (brown writing). 4) Take the Rhodes Drive/Muizenberg-M3 turn off. 5) You will pass Mostert's Windmill on your left and the University of Cape Town and Table Mountain will be on your right. 6) After about 4 km at the first set of traffic lights, turn left into Newlands Avenue-M63 towards Rondebosch. 7) Take the second on your left Van Reenen Street. 24135 page views since 18 Jul, 2003.